In the years following World War II, an audacious British plan would have used Nazi rockets to put a man in space. In the summer of 1945, with the war in Europe over, Allied forces rushed to unravel the secrets of Nazi V2 rockets. These terror weapons, built by slave labourers, did little to affect the outcome of the war – but they had the potential to change the world. The leader of Hitler’s Vengeance weapon program, Wernher von Braun, surrendered to American forces in May 1945 and was quietly spirited away to the United States. In the same month the Russians captured Von Braun’s research and test facilities at Peenemunde on the Baltic coast. 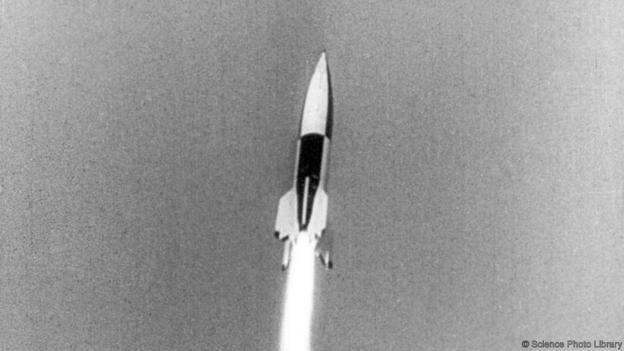 The French, meanwhile, gathered some 40 German rocket scientists and engineers and the British assembled rockets for a series of test flights. It’s the land of mysterious monsters lurking beneath glistening waters, soaring mountains a hundred shades of purple with heather, and not forgetting those craggy castles and enticing pubs. Known as Operation Backfire, the British program involved firing V2 rockets from the Netherlands to the edge of space before they splashed down in the North Sea. 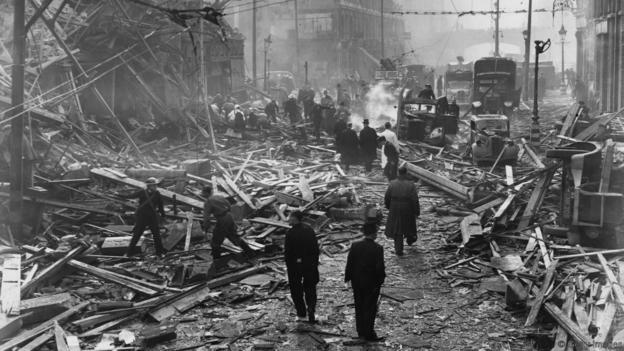 The experiment proved successful, with the missiles reportedly descending within three miles of their targets – more accurately than the Germans managed during the war. Engineers overseeing the tests realized that von Braun had solved fundamental problems in rocketry: he had designed a sizeable engine, an advanced pump to get fuel in fast enough and a sophisticated guidance system. Smith’s Megaroc design involved enlarging and strengthening the V2’s hull, increasing the amount of fuel and replacing the one-tonne warhead with a man-carrying capsule. 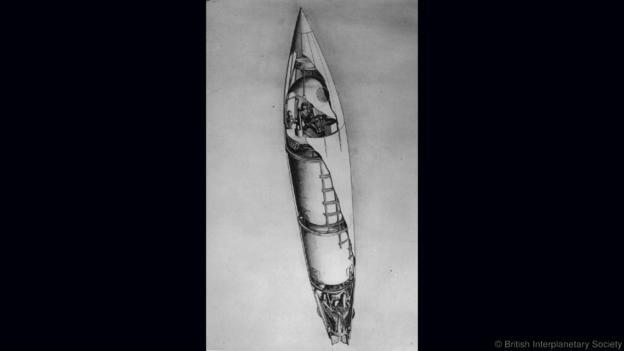 The rocket would not have been powerful enough to carry a person into orbit. Instead, the spaceman (and only a man was considered) would have been launched on a parabolic trajectory some 300,000 metres above the Earth. Launched at an angle of two degrees, once in space the rocket would drop away and the segmented nose-cone would peel back to expose the capsule. Smith provided two windows in his design and suggested the space pioneer, kitted out in a high-altitude flying suit, might use his few minutes in space to carry out observations of the Earth, atmosphere and Sun. With the West squaring up to the Soviet Union, Megaroc would also have been ideal for spying on enemy territory. After five minutes or so of weightlessness the capsule would fall back to Earth, its heatshield protecting the spaceman from harm. Parachutes would be deployed and it would float slowly to the ground. There was even a separate parachute for the rocket, intended to make the whole spacecraft reusable. Smith worked out everything – from the exact dimensions of the rocket to the thrust of the engines and g-forces the astronaut would experience. Baker, who was trained on V2 technology in the States and has spent most of his career as a Nasa engineer working on the Space Shuttle programme, says Megaroc was 10 years ahead of its time. “By 1951 Britain could have been routinely putting people into space on a ballistic trajectory,” he says. Smith submitted his spacecraft design to the British government’s Ministry of Supply in December 1946 but a few months later it was rejected. Smith abandoned the project, moving on to design spaceplanes and giant orbiting space stations. Despite its head start with Operation Backfire, Britain decided to abandon V2 tech and focus its limited research resources instead on aviation and nuclear technology. On the other side of the Atlantic, the story was very different. The US military gave Von Braun whatever resources he needed to develop the V2 into a next generation rocket. The result was the Mercury-Redstone, which blasted America’s first astronaut, Alan Shepard, into space in 1961. In an alternate reality, where the Ministry of Supply had said yes, the world’s first astronaut could have been British. This would be just another might-have-been story consigned to the bulging shelves of the British Interplanetary Society archives were it not for the parallels with today’s new era of private rocketry, personal satellites and innovative spaceplanes. Building brand new reusable spacecraft on a limited budget is exactly what companies such as Virgin Galactic and Xcor are trying to do today. Other small firms, such as UK company Reaction Engines, are developing innovative propulsion systems to power the reusable spacecraft of the future. Follow BBC Future on Facebook, Twitter, Google+ and LinkedIn. This story is a part of BBC Britain – a new series focused on exploring this extraordinary island, one story at a time. Readers outside of the UK can see every BBC Britain story by heading to the Britain homepage; you also can see our latest stories by following us on Facebook and Twitter. 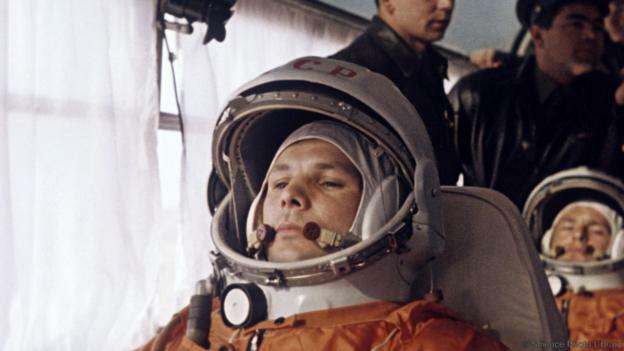 Do astronauts dream of space?